As we set out to construct the history of exhibitions from our contemporary vantage point, one of the central questions to consider is the relationship between models that emerged in the postwar European context—between the years 1945 and 1972—and current artistic and curatorial practices. The genealogies that we establish are not only significant because of their institutionalizing power, authorizing the preeminence of specific artists, curators, and exhibitions while potentially obscuring others; they also allow us to reflect on the connections and ruptures between the postwar period and our contemporaneity. As an art historian, a crucial aspect of my own project of writing about modern and contemporary art is to explore both the critical “potentialities” and historical “blind spots” of aesthetic paradigms and propositions. To understand how traditional disciplinary narratives have been formed and, for the most part, continue to maintain the hegemonic role of Western modernism and its biopolitics, we need to reflect on the questions that are asked, methodologies employed, and theories applied to the art objects and aesthetic events that are the focus of our study. Towards this goal, one of this article’s central interests is to delineate the ruptures and continuities in the understanding of the labyrinth, analyze its function in organizing exhibitionary practices, and consider its role in engendering specific types of social bonds within two distinct economic phases: liberalism and neoliberal global capitalism. Through a short excursus, in two parts, I demonstrate the ways in which the aesthetic, curatorial, and exhibitionary techniques for the administration of life have changed since the postwar years. Thus, the first part of this article examines the labyrinth’s emergence as an outgrowth of the economic liberal model of the 1950s and ’60s in the Western European context. Here, I suggest that the labyrinth appears as a very powerful, normative formal structure, simultaneously linked to organizing and maintaining the biopolitics of First World Subjects and consolidating the authorial role of the museum. In the second part, I shift the focus to recent years—broadly speaking, the post-2008 period, and between 2016 and 2018 specifically—to examine the labyrinth’s transmutation in the neoliberal global context. Here, I claim that the labyrinth, simultaneously sited in large-scale exhibition structures and unfettered within digital networks, participates in producing a system of social differentiation between biopolitical and necropolitical “forms of life.” Through this analysis, which moves from a self-reflexive European modernism to conditions of globalization, we may venture to guess that the labyrinth would also mutate from a universal model, supporting and reproducing Western hegemony, to one able to constitute and accommodate global singularities. My conclusion, however, points to the ongoing dominance of the Western model of the labyrinth, one supported by “capital’s regime of humanization and… contemporary capital subsumed in the unfished project of Western modernization.” In other words, I argue that although the labyrinth has clearly permutated and has been curatorially choreographed in various ways since the 1960s, it is still primarily embedded within the logic of the reproduction of modes of life and death as they are dictated by Western Europe. As this issue of Stedelijk Studies suggests, at a certain moment in the 1960s and with the support and international network of two prominent museum personalities—Willem Sandberg and Pontus Hultén—the labyrinth crystallized as an important exhibitionary format. 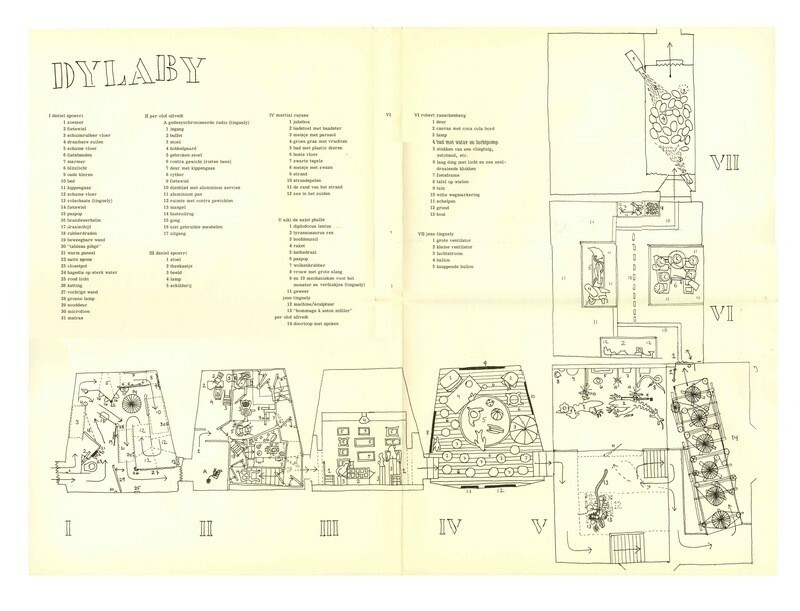 At the Stedelijk Museum in Amsterdam (1962), Sandberg curated the seminal exhibition Dylaby (Dynamisch Labyrint), which included Robert Rauschenberg, Daniel Spoerri, Jean Tinguely, Nikki de Saint Phalle, Martial Raysse, and Per Olof Ultvedt (fig. 1). A few years later (1966), Hultén invited Saint Phalle, Tinguely, and Ultvedt to present the collaborative sculptural installation HON – en katedral (SHE: a cathedral) at the Moderna Museet in Stockholm (fig. 2). As is well-established, these two exhibitions were symptomatic of a broader constellation of artistic interest in the “labyrinth” in the European public sphere. Importantly, unlike the classical typology of the labyrinth, in which “there are no choices to be made and the path inevitably leads to, and ends at, the center,” the diverse postwar labyrinths and “labyrinthine” practices fought against the ideal of an immutable center. That center was not only conceived as a point in space but, during the heyday of existentialism, also elided with the notion of truth or any ultimate authority. Philosophically and phenomenologically, the labyrinths of the 1960s may have been directed, but the “walker” did not have to “retrace the same path to return to the outside.” Though the various formats were clearly not unified around a single or static meaning, artists and curators arguably tried to disrupt and thereby transform everyday life in environments that “activated” the spectator through chance encounters and novel interactions with a host of objects and spaces. Fig. 1. Dylaby, Plan, Stedelijk Museum Amsterdam, 1962. My point of departure is based on the premise that exhibitions are production sites for new concepts, subjectivities, and social imaginaries and, consequently, that in exhibitions such as Dylaby and HON the labyrinth was envisaged as a format that would stage the dematerialization of well-established modernist borders between spectator and artwork, alter power structures on a micro-dimension, and transform social relations at large in the context of an intensifying mass culture. As such, the labyrinth should also be considered an “event” that “activated the potential of subjectivity in its sensible dimension,” which the world understood not simply through a distinct outline of aesthetic “forms” apprehended through perception but also through its “field of forces” grasped through sensation. The event, according to the Deleuzian theorist Suely Rolnik, emerges from a disparity between these two modalities of subject formation—perception and sensation—and the culmination of a subjectivization of processes “unleashed by those two experiences of otherness.” This designation is crucial, because any attempt to map a permutating cartography of the labyrinth requires an attentiveness to its multiple functions and identities, including as an event that mobilizes subjectivity through sensation and that becomes consolidated as a biopolitical technique. Fig. 2. 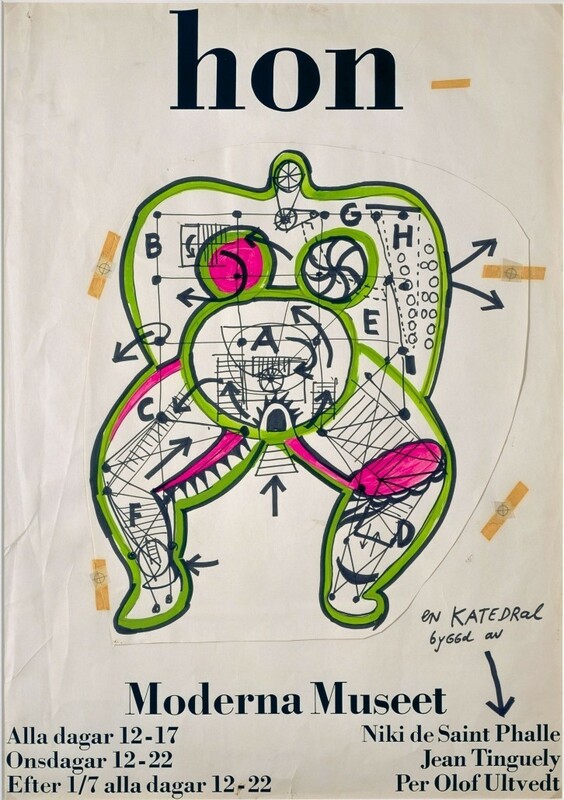 Niki de Saint Phalle and Jean Tinguely sketch for the poster for HON – en katedral, not dated . Collage, felt-tip and gouache on paper (offset print), 100.2 x 70 cm. Collection Museum Tinguely, Basel. Photo © Museum Tinguely, Basel. Courtesy of Pictoright Amsterdam 2018. Evoking Johan Huizinga’s Homo Ludens (1938), a study dedicated to the “play-element in culture,” this passage makes visible Dylaby’s focus on ludic interactions that would affect the sensorial realm and shape new relations between life and art in the context of advanced capitalism. The Stedelijk Museum was, for the most part, populated with everyday objects, such as balloons, clocks, jukeboxes, machines, Coca-Cola signs, tires, and beach toys, yet “traditional” art was also represented (Spoerri included paintings and sculptures from the museum’s permanent collection, albeit hung at ninety degrees). Inspired by Dylaby’s array of amusements, HON ambitiously offered a fake painting gallery, a twelve-seat cinema (projecting Greta Garbo’s slapstick film Luffar-Petter from 1922), a milk bar in the figure’s right breast, and a planetarium in her left breast. Her left hip contained Tinguely’s radio sculpture (Radio Stockholm) while her knee housed a “bench for paramours” sheathed in red velvet. Access to HON was controlled by green and red lights at the vaginal entrance—a nod to a society marked by both sexual liberation and automation. The single, supine female body served as a variegated house of madcap entertainment and indoctrination. Thus, in the face of economic modernization characterizing the postwar years, Dylaby and HON integrated the emergent daily habits of its users, what Henri Lefebvre and Guy Debord identified as a quotidian marked by consumption, organized leisure, and spectacle. Let us return to the last three lines of the curatorial statement, which are especially telling (“you are not outside the objects but constantly within them as part of a whole”). Here, we observe the desire to erode the distance and hierarchical differentiation between the museumgoer, art object, and architectural parameters of the museum, and to pose a certain equality of forms. While the “center” of the labyrinth may have formally disappeared as a fixed space, I suggest that in Dylaby and HON the museum continued to assert itself as the pivotal controlling mechanism. It is by dint of the museum’s governing role, and its aim to subsume the emergent antinomies, frictions, and lines of flight (i.e., the components that make up “surplus value”) into a “whole,” that the (everyday) “objects” continued to operate within the category of “art.” Even as fun and games were promised, the unforeseeable and contingent aspects of the event were nevertheless meant to relay back to a whole that would not only be greater than these diverse parts but, ultimately, serve to legitimate the museum and regulate the emergent subject. If, on the one hand, the invited artists were pushing the categorical limits and conventions of art and the museum, on the other, the public was invited to extend the limits of their creative agency. Yet, in each of the seven rooms in Dylaby and the diverse environments of HON, disorientation was carefully crafted and did not surpass a threshold of intelligibility or normativity. While the art historical scholarship has identified the “social turn,” participation, and collaboration as characteristic of a spectrum of artistic practices that emerged in the late 1990s, most prominently linked to relational aesthetics and socially engaged art, I claim that we are at an urgent crossroads in which artistic practitioners are not only vying to invent new exhibitionary formats but are actively searching for new concepts through which to imagine the world. In this context, it is worth examining the permutation of the labyrinth, a participatory environment that tried to engender innovative phenomenological and perceptual experiences in museum exhibitions, biennials, and the public sphere. Without confounding the historical situation of the 1960s with our contemporary neoliberal context, Dylaby’s opening statement makes visible a critical intersection between a discourse of participation, interactivity, and precariousness (“chance”), and sensorial and phenomenological techniques that have the capacity to be both liberatory and regulatory. The labyrinth is the architectural, discursive, and conceptual crux of this aesthetic-sociopolitical constellation: it simultaneously serves as the apparatus—or constitutive dispositif—that structures the imminent (dematerializing) shift toward new practices, shapes a type of individualization marked by contingency, and operates as a biopolitical technique for governing a population immersed in a “dramaturgy” of precarization. In our contemporary world in which railway stations become museums and churches are turned into night-clubs, the old, stable coordinates cease to apply […] These imbrications of elements lead, potentially, to new social relations altering the once stable contours of institutions and accelerating the process of change on the way. They disrupt and disfigure but, simultaneously, reconfigure, providing a rich texture of experiences that redefine urban actuality: city-events, event-cities. Today it is not only metropolitan territories that are organized as spaces for the staging of events. Crucially, most large-scale exhibitions have also been transformed from a type of backdrop into intertextual sites of action. If this was an avant-garde operation in the 1960s, I would venture to suggest that it is now the exhibitionary doctrine. Yet, Tschumi’s analysis also needs to be updated in the age of social technology; since information travels in real time across the globe via digital networks, “events” no longer occur solely in physical space. They are now experienced on a multitude of screens, platforms, and apparatuses, and are shared by heterogeneous publics that may never encounter each other in situ. The extension into cyberspace and the infosphere has not just monetized the event, it has also transformed its shape, temporality, and locus to make it continuous and unrestrained. The labyrinth-as-event is produced, circulated, and consumed at an intensifying speed, thus creating a surplus value that always exceeds the limits of the exhibitionary complex and transmutes into new forms. Second, the labyrinth has concomitantly migrated into structures that organize and create what Giorgio Agamben has termed “forms of life.” As the self is shaped via bioengineering and biometric data, virtual reality and artificial intelligence, algorithmic financial markets and immaterial labor, our notions of participation (and passivity) have also undergone a transformation so that the labyrinth is not simply “out there” as an external exhibitionary format, architectural envelope, or an urban festival, but fundamentally integrated into methods and techniques of subjectivation. This biopolitical assimilation of the labyrinth as a dispositif to produce individuals and populations goes hand in hand with the increasingly blurred borders between public and private spheres in post-Fordist forms of production. “I believe,” states Paulo Virno, “that in today’s forms of life one has a direct perception of the fact that the coupling of the terms public-private, as well as the terms collective-individual, can no longer stand on their own, that they are gasping for air, burning themselves out. This is just like what is happening in the world of contemporary production.” Virno’s diagnosis is based on identifying current modes of production, which are linked to flexibility in the labor force, a permanent state of contingency, unpredictability and crisis, and an emphasis on communicative and performative abilities. Production, reproduction, and sociality are at once deeply entangled and extremely precarious. The labyrinth has thus permutated into an entanglement between “event” and “form of life” as constitutive of the present. It is with this double and mutually entwined typology in mind—namely as an event and a form of life—that I would like to specifically examine two large-scale exhibitions that appeared almost side by side in the last two years. In considering the 9th Berlin Biennale for Contemporary Art (Berlin, June 4, 2016 – September 18, 2016) and documenta 14 (Kassel and Athens, April 8, 2017 – September 17, 2017), we may observe two distinct approaches to the contemporary labyrinth. Though these two exhibitions may initially appear vastly different in their curatorial methodologies, theoretical frameworks, and aesthetic sensibilities, I claim that they simultaneously enact and constitute a response to the contemporary prevalence of the labyrinth as a global configuration that is simultaneously produced by and reproduces neoliberal capitalism. Specifically, what are the contours and characteristics of the event that each of these two exhibitions proposed? And what types of subjects do they produce? Fig. 3. Speculative Ambience, 2016. Video Still, produced by Iconoclast. Courtesy Berlin Biennale for Contemporary Art. The 9th Berlin Biennale (9BB), titled “The Present in Drag,” was curated by the New York-based online collective DIS (Lauren Boyle, Solomon Chase, Marco Roso, and David Toro) (fig. 3). Like previous Berlin Biennales, the ninth edition used various sites throughout the city, including the Akademie der Künste, the ESMT European School of Management and Technology, the Feuerle Collection, KW Institute for Contemporary Art, and the Blue-Star Sightseeing Boat of Reederei Riedel. The curatorial choice of DIS, known for virtual platforms that synthesize fashion, music, advertising, and art, signaled “the first large-scale institutional attempt to integrate contemporary art, not only materially—this was achieved decades ago by the total industrialization of the production and dissemination of art—but also philosophically into the larger frames of creative design, commerce and popular culture.” Indeed, what this “philosophical contemporaneity” meant is that, on the curatorial level, most of the participating artists fell under the moniker of “post-internet,” an evolving term characterizing a broad spectrum of practices emerging from the conditions of possibility produced by networked technologies. The roster of artists included Jon Rafman, Simon Denny, Lizzie Fitch/Ryan Trecartin, Amalia Ulman, and Puppies Puppies, just to name a few. Meanwhile, on the discursive level, the 9BB was framed by writers and philosophers associated with accelerationism, a political theory that advocates embracing the project of capitalist accumulation until it implodes. To enter the post-capitalist, post-work age, accelerationists call for moving through capitalism with intensified speed rather than retreating from it. The common tools of visual and political persuasion—variously employed by state and market, left and right, art and commerce—swarm both the biennial as institution and “art” as a category of cultural production. 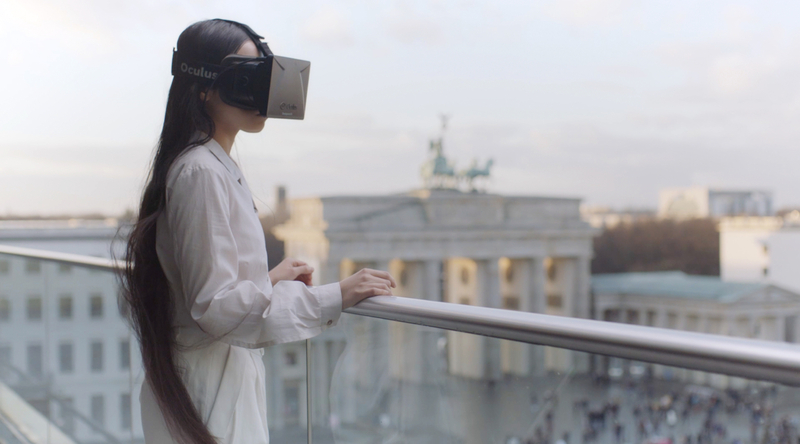 The 9th Berlin Biennale for Contemporary Art materializes the paradoxes that make up the world in 2016: the virtual as the real, nations as brands, people as data, culture as capital, wellness as capital, happiness as GDP […] Just as the figure of the individual seems to loom larger than ever, her individuality has been busted up and shattered into fragments by countervalent, contradictory forces. The 9th Berlin Biennale will create a stage for this actor for the self to roleplay her own obsolescence. Our proposition is simple: Instead of holding talks on anxiety, let’s make people anxious. Rather than organizing symposia on privacy, let’s jeopardize it. Let’s give a body to the problems of the present where they occur so as to make them a matter of agency—not spectatorship. This proclamation is remarkable because of its articulation of the complete elision between cultural production and the flows of capital, the disappearance of the individual as the dominant category of subjectivity and its reformulation as an “economic agent,” and the role of the biennial as a specialized ontological platform for the exacerbation of a mutating capitalism. Under DIS’s curatorial vision, the 9BB thus staged an event that performed a “post-contemporary” form of life. This is a future-oriented, nonbinary, self-interested, paranoiac subjectivity that is fueled by the uncertainty, anxiety, and precarity of capitalist accumulation. A year later, under the curatorial directorship of Adam Szymczyk and with the so-called working title “Learning from Athens,” documenta 14 (d14) presented a different approach to the contemporary labyrinth. The fourteenth edition of documenta—the quinquennial exhibition established in 1955 to rehabilitate Germany’s recent National Socialist past and realign it with Western liberal democracy—was split and shared between Athens and Kassel, making it both “guest” and “host.” The exhibition was distributed across various venues at both locations, although the same artists were represented in Greece and Germany. Famously, the collection of Greece’s National Museum of Contemporary Art (EMST) was displayed in Kassel at the Fridericianum, which many acknowledge as the historical nucleus of documenta. A partnership with Aegean Airlines made it possible for visitors to travel directly between cities on specially chartered flights that operated from the exhibition’s opening until June 23, 2017. The massive binational undertaking was accompanied by extensive programming that included a worldwide public radio program diffused over nine different stations in Greece, Germany Cameroon, Indonesia, the United States, Colombia, Lebanon, and Brazil; a weekly broadcast of films presented by the Hellenic Broadcasting Station on the channel ERT2; three publications including the documenta 14: daybook, The documenta 14 reader, and the journal South as a State of Mind, which devoted four special issues to themes connected to the exhibition; an “aneducation” program involving a “chorus” that accompanied visitors on “walks” through the exhibition and functioned as nontraditional pedagogical interlocutors. Fig. 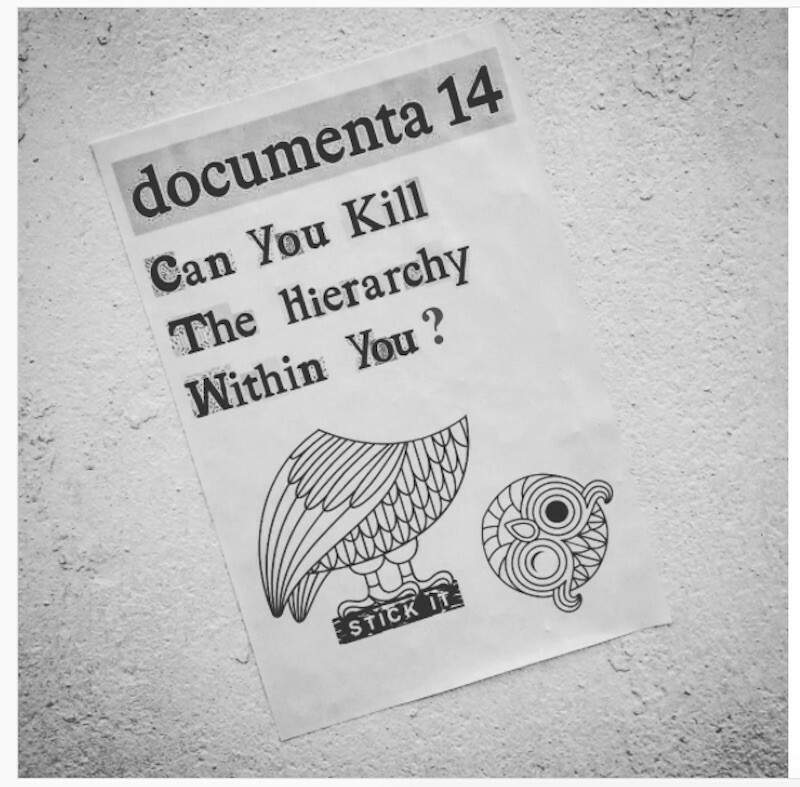 4. documenta 14, The Parliament of Bodies – Working Group (Distomo with Argyris N. Sfountouris and Margarita Tsomou), 2017. Photo © Nils Klinger. While each of these endeavors was compelling and can be examined more closely for its distinct methodology, the ensemble of these public initiatives may also be considered together. Under the appellation “Parliament of Bodies,” they were described as a reaction to the “so-called long summer of migration in Europe, which revealed the simultaneous failure not only of modern representative democratic institutions but also of ethical practices of hospitality. The Parliament was in ruins. The real Parliament was on the streets, constituted by unrepresented and undocumented bodies resisting austerity measures and xenophobic policies.” Indeed, d14 was fiercely committed to making visible the current social and political crisis in Europe and the overwhelmingly Eurocentric positions that have structured modernism, modernity, and their aftermaths (fig. 4). All aspects of the exhibition, including the decision to decenter documenta’s “home,” were guided by a moral and ethical imperative to contend with the “necessity to act in real time and in the real world.” Curatorially, this obligation meant the inclusion of artistic practices that indexed the entanglement between political processes and capitalism throughout the twentieth century; the impact of colonialization and decolonialization on vast swaths of the planet, and the consequences of racialization under fascism, totalitarianism, and neoliberalism. In other words, this was an exhibition that dealt with the fragmentation, repression, or disappearance of histories, identities, bodies, and genealogies resulting from the historical processes of European modernity. The post-internet art practices selected by DIS are stylish, image-conscious, and hip, producing sleek biopolitical subjects that become “brands” for Berlin. Take, for instance, Amalia Ulman’s Privilege (2016), an installation and online performance chronicling a fictional pregnancy that is indicative of the aesthetic and conceptual posture assumed by the 9BB. The “privilege” in the title is linked to the artist’s awareness that her “whiteness” is a “dominant aesthetic of power” and that her “own access to realms and persons of prestige” often comes at “[her] own expense and fatigue.” Ulman is only one such representative of highly privileged and privatized forms of life produced by and for the First Capitalist World. Her work simultaneously performs the seduction of capital as it aggregates in the production of the self on social media and its continuous reproduction in image-worlds. It also elides one of the most powerful processes of making and giving life (pregnancy) with a reified semblance of a social world (Instagram). Ulman’s Privilege is thus representative of a prevalent iteration of the “event,” in which all aspects of life are inscribed into uninterrupted market transactions, information networks, and other financial systems. Crucially, following Suely Rolnik, I propose that Ulman’s work, specifically, and the 9BB more generally, are significant because they signal the replacement of a modernist “public life… by a global reality show orchestrated by a cultural-informational capitalism that has taken over the entire planet. A kind of world-wide display screen where people jostle their way toward a possible role as an extra, a fleeting and imaginary place that has to be incessantly administered, invested and guaranteed, against everything and everyone.” This deregulation and distribution of experience beyond the borders previously established by modernism goes hand in hand with the formation of a new subject of sensation. This is one who feels the flows of capital—at the level of the sensory—at the same time as he or she perceives themselves coming into appearance as images on various screens. The labyrinth, as the grounding for such an ontological and epistemological event, supports this narcissistic (some would add, unlivable) elision between sensation and perception. Fig. 5. Anonymous, poster in Athens, Spring 2017. Photographer unknown. To its credit, unlike 9BB’s uncritical fetishization of the present, d14 delineated the connections between the situation of present-day Greece and longer historical processes. This includes the period of the right-wing military junta, also called the Regime of the Colonels (1967–74), whose road to power can be traced back to the Axis occupation of the country during World War II. In this perspective, d14 invited the Greek architect Andreas Angelidakis to remodel the architecture of the Athens Municipality Arts Center, which served as the military police headquarters during the Regime of the Colonels before being turned into a “white cube” in the 1980s. 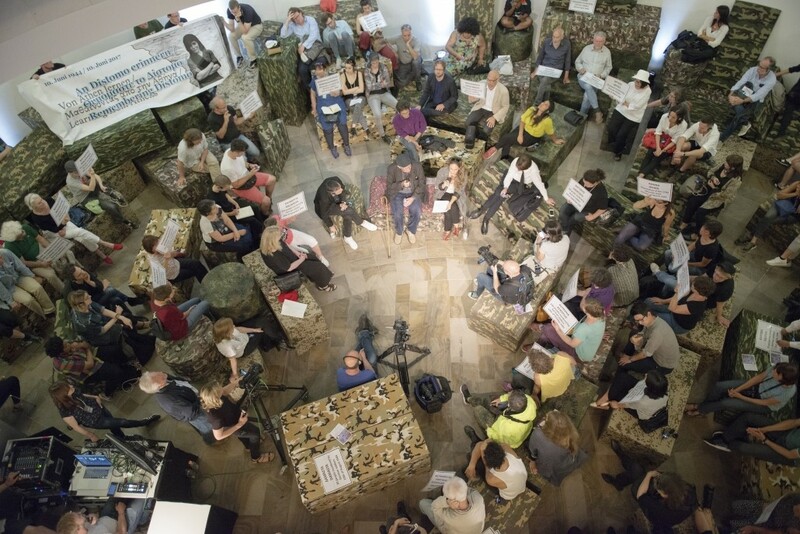 Following Angelidakis’s strategic interventions, which materially made visible the location’s previous history, the center was activated as a forum for the Parliament of Bodies. The democratic processes that had been eradicated during the Regime of the Colonels became reinstated in the form of what political scientist Isabell Lorey has termed a “presentist democracy.” Meanwhile, Eirene Efstathiou’s Anniversary (2010) consists of thirty-six lithographs composed of found images that document the annual memorialization between 1974 and 2009 of the student uprising of November 17, 1973. The occupation of the Athens Polytechnic (an event known as the Athens Polytechnic uprising) led to the collapse of the military regime but also instantiated a regime of representation that mythologized the democratic transition. Indeed, many artists included in d14 (e.g., Naeem Mohaiemen, Andrzej Wróblewski, and Sanja Iveković) made clear that, between 1945 and 1989, artists were contending with the fragmentation and redistribution of political space in ways that made visible that the post-1989 world did not “emerge” fully formed or as a foregone conclusion. Prominently, the vexed issue of the “historical debt” that binds Germany and Greece together and operates along governmental, ideological, and financial registers continued to be articulated and enacted even before the exhibition’s conclusion. Beginning in mid-September 2017, in a controversy that is still unfolding, the stakeholders of documenta accused Adam Szymczyk, the artistic director of d14, and Annette Kulenkampff, CEO of documenta gGmbH, of gross financial mismanagement and the near-bankruptcy of the exhibition. The overall budget of d14 was €37 million ($50 million), half to be subsidized by Hesse, Kassel, and the German Federal Chancellery, and half to be raised by ticket sales. Following an external review by independent auditor PricewaterhouseCoopers (PwC), the Hessische/Niedersächsische Allgemeine (HNA), a regional newspaper published in Kassel, claimed that the exhibition faced a deficit of €5.44 million (previously reported as €7 million, or roughly $8.3 million). The overspending was blamed on documenta’s expansion to Athens, with accusations of exorbitant electricity bills to maintain climate control and high costs to transport works. This dispute resulted in a number of outcomes: Kulenkampff stepped down a year before her contract was to end and documenta gGmbH announced that it would “implement new organizational, personnel, and financial structures to help ensure the success of its future editions.” In response, Szymczyk countered, “Blaming ‘Athens’ for the trouble is an easy political excuse, opening the way to limiting the autonomy of any future documenta through managerial ‘adjustments,’ thus undermining the fundamental premise of the project—its autonomy.” The assault on documenta’s artistic independence went hand in hand with a media offensive by the right-wing extremist party Alternative für Deutschland (AfD), which attacked Kulenkampff, Szymczyk, and Bertram Hilgen, the former mayor of Kassel. Thomas Materner, a member of the AfD and a Kassel city council member, also called the Monument for Strangers and Refugees “entstellte Kunst,” evoking the Nazi term “degenerate art.” The sixteen-meter-tall obelisk by Nigerian artist Olu Oguibe was erected in the center of Kassel and is inscribed with the Bible verse “I was a stranger and you took me in” (Matthew 25:35), in Turkish, Arabic, German and English. The AfD’s incendiary statement makes evident that Germany’s political shift to the right, following Angela Merkel’s decision to temporarily open the country’s borders for asylum seekers in 2015, has not just become more pronounced, but has been granted public legitimacy. This short excursus into the permutation of the labyrinth has shown the ways in which the aesthetic, curatorial, and exhibitionary techniques for the administration of life have changed since the postwar years. In the aftermath of World War II, artists and museums sought ways to represent capitalist modernization while also acknowledging the erosion of older patterns of everyday life. The labyrinth, a format for participation and interactivity, at once converged with commodified forms of leisure time (play, distraction, and entertainment) and tried to forge new pathways to evade such structures. In Dylaby and HON, we find the accommodation of the labyrinth to museological institutions whose objectives were to construct new publics, in part by showcasing contemporary practices that would cater to the “frisson” of “illicit” amusement. The experiences in these exhibitions, which were delineated by their status as temporary events, coincided with the invention of a capitalist form of subjectivity mobilized by sensation. These labyrinths extended beyond phenomenological perception and formulated a new sensorial territory of existence that necessitated new biopolitical techniques of discipline. More than fifty years later, exhibitions such as the 9BB and d14 reveal the ways in which the labyrinth has transformed in the context of neoliberal global capitalism. While it still functions as a dispositive for an event, it is one that is simultaneously located in a specific (if multiple and decentralized) location and diffused through cybernetworks. Moreover, while it continues to produce “forms of life,” these are now more extremely polarized between privileged populations and the dispossessed. To follow Gilles Deleuze’s expansion of Michel Foucault’s analysis of power, what we observe in the 9BB and d14 is the articulation of the labyrinth through two regimes of power. In an influential article from 1990 titled “Postscript on the Societies of Control,” which traces the shift from capitalist production to financialization, Deleuze argues that disciplinary regimes of power have been superseded by societies of control. If disciplinary societies relied on forms of regulation and management linked to specific sites—school, work, home, factory—and contained possibilities for evasion and disruption, societies of control are characterized by their unrestrained structures and penetration of discipline within all aspects of life. Countering Deleuze, Jonathan Crary has convincingly argued that our contemporary reality is controlled by both regimes of power, which function at different intensities and along different strata. While affluent populations, such as those dominantly represented by the 9BB, may be integrated into the apparatuses of financial communication and global mobility, there are entire sections of the world, as made clear in d14, which are regulated by the disciplinary forces of borders and brutal spaces of confinement. For the projected denizens of DIS’s labyrinth, the privilege of “stylization” goes hand in hand with a boundless cosmopolitanism. It is an image of the world in which deregulation and precarity are sold as a promise of de-territorialized flexibility. For the “people” imagined in the labyrinth of d14, meanwhile, there was a clear a split between the (European) subject of privilege—who could afford to take the special flights between Athens and Kassel and possesses the documents to enter the European Union—and those who are entirely banished from this entitled form of life. Here, privatization became the state discourse of regulation and control in the supposed best interest of the not-yet-fully civilized subjects, namely the Greek population suffering from the austerity measures imposed by the EU and the refugees whose access to the EU is narrativized as a sociopolitical crisis. Privatization also becomes a form of governmentality meant to protect one’s own citizens, namely the German taxpayers whose money is allegedly being mishandled by documenta. In the apparent distinctions between the two exhibitions and their exploitation of the labyrinth as an event and a form of life, we see two sides of a global system. Under the aegis of accelerationism, the 9BB dramatized the consolidation of information systems into the matrix of a 24/7 society of control; under the banner of a presentist democratic collectivity, d14 revealed the divergence between those who live in disciplinary regimes—managed by secured enclosures—and those who inhabit societies of control, thereby also enjoying quasi-infinite mobility. If the labyrinth operates as the dispositif for all aspects of this system, we must be attentive to the techniques differentiating and managing the sensorial realm of its subjects. The 9BB was a showcase for positivized biopolitical subjects (the production and reproduction of life) who are granted the privilege of participating in the First Capitalist World, while d14 was a forum that made visible the fate of necropolitical subjects (the production and reproduction of death) who are outside that realm. Ultimately, German “ownership” of both exhibitions—as it relates to corporate property and real estate in Berlin or the claim to monetary control in Kassel/Athens—shows the total integration of the contemporary labyrinth within neoliberal global capitalism. This article has demonstrated that to write the history of exhibitions is to create genealogies of the present with an awareness that artistic practices, forms, events, and modes of life are entwined with the plural material processes of Western modernization. Specifically, this article has shown that the inscription of human life has been pivotal to aesthetic, curatorial, and exhibitionary techniques linked to the labyrinth as it emerged in the 1950s and ’60s, and evolved in the post-2008 period. Following Deleuze and Rolnik, we have seen that the labyrinth—as form and event—has mediated the changing modalities of perception and sensation, which are crucial to the process of subjectivization and the constitution of modes of life. Based on Foucault, Deleuze, and Crary, it has become clear that the labyrinth’s affiliation with a disciplinary society, which controls specific sites, eventually morphed to include a society of control, an unrestrained world system of financialization that expands beyond physically enclosed spaces. Given these changed historical conditions between the postwar period and our present, we may ask why the labyrinth has enjoyed such longevity in various museological and curatorial contexts. One possibility is that the labyrinth is entwined with an implicit promise of a shared social experience, one that is both immanent to and distinct from our quotidian experience. Within this aesthetically constructed space of togetherness, sited in museums or large-scale exhibitions, the labyrinth offers us a tacit assurance that we will benefit from two dynamics. The first is the “customization” of the social within processes of capital, while the second is a partial rupture from the rhythms of mass synchronization. Thus, labyrinthine frameworks continue to be reproduced, and we continue to seek and validate them, because we would like to have the personalized experience of “being there” (with others) while, at the same time, wishing to detach from or disrupt the routinization of our lives (also in the company of others). This is the paradox of the labyrinth: it enacts a social contract, even though shared and collectively supported human relations have been increasingly eroded, even devastated, in the last half century. Author’s note: I am grateful to Gregor Pirgie for his committed and intrepid research assistance for this article; I would also like to thank the two anonymous peer-reviewers whose generous critical comments were beneficial to this article’s refinement. Art historian and critic Noit Banai is a professor of contemporary art in the Department of Art History at the University of Vienna. Her book on Yves Klein was published in the Critical Lives series (Reaktion Books, London, 2014) and she is currently working on a book project titled “Imagining Europe between Nation State and Border State: Public Disorder and the Search for a Universal Subject,” which examines the aesthetic mediation of “Europe” from the postwar years to the present. She is a regular contributor to Artforum and Texte zur Kunst, and a contributing editor at Art Papers. For an analysis of global capital and its self-reproduction in economic, political, ideological, and institutional structures, see Marina Gržinić and Šefik Tatlić, Necropolitics, Racialization, and Global Capitalism: Historicization of Biopolitics and Forensics of Politics, Art, and Life (Lanham, MD: Lexington Books, 2014) 13. The Situationist International translated the fragmentary experience of the labyrinth into their urban dérives and theoretical texts, most prominently in Asger Jorn and Guy Debord’s Mémoires (1958); in how Constant Nieuwenhuys inscribed the labyrinth into the utopian architectural renderings of New Babylon (1959–1974); in Daniel Spoerri’s An Anecdoted Topography of Chance presented a cartographic labyrinth (1962); and in the numerous experiential labyrinths that Groupe de Recherche d’Art Visuel (GRAV) initiated in their “seven successive cells” at the Third Paris Biennale (1963), expanded to the urban interventions in Une Journée dans la Rue/A Day in the Street (1966). In literature, Alain Robbe-Grillet’s novel Dans le labyrinth (1959) stands out as an important example of the nouveau roman’s attempt to use labyrinthine form as an attack on literary and societal norms. For additional information on Dylaby, see Ad Peterson, “Dylaby, ein dynamisches Labyrinth im Stedelijk Museum 1962,” in Die Kunst der Ausstellung: Eine Dokumentation dreißig exemplarischer Kunstausstellungen dieses Jahrhunderts, eds. Bernd Klüser, Katharina Hegewisch (Insel Verlag: Frankfurt and Leipzig, 1991). For additional information on HON, see Pontus Hulten, Niki de Saint Phalle (Berlin and Stuttgart: Verlag Gerd Hatje, 1992); see also Bloum Cardenas, Ulrich Krempel, and Andres Pardey, Niki & Jean: l’Art et l’Amour (Munich: Prestel Verlag, 2006). 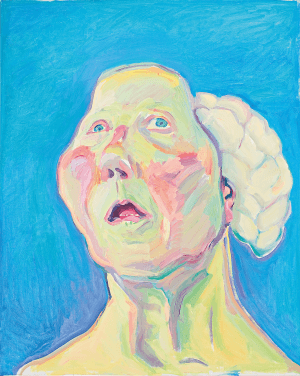 DYLABY (Dynamisch Labyrint), exh. cat. (Amsterdam: Stedelijk Museum, 1962). Johan Huizinga, Homo Ludens: A Study of the Play-Element in Culture (Boston: Beacon Press, 1955). Nicolas Bourriaud, Relational Aesthetics (Dijon: Les Presses du réel, 2002); Grant Kester, The One and the Many: Contemporary Collaborative Art in a Global Context (Durham, NC: Duke University Press, 2011); Claire Bishop, Artificial Hells: Participatory Art and the Politics of Spectatorship (London: Verso, 2012); Nato Thompson, Living as Form. Socially Engaged Art from 1991–2011 (Cambridge, MA: MIT Press, 2012). See Hans Richard Brittnacher and Rolf-Peter Janz, eds., Labyrinth und Spiel: Umdeutungen eines Mythos (Wallstein: Göttingen, 2007). Gordana K. Fontana-Giusti, “The Landscape of the Mind: A Conversation with Bernard Tschumi,” in Architecture and Culture 4, no. 2 (2016): 272. Bernard Tschumi, Event-Cities (Cambridge, MA: MIT Press, 1994), 13. Giorgio Agamben, Homo Sacer: Sovereign Power and Bare Life, trans. Daniel Heller-Roazen (Stanford: Stanford University Press, 1998). Paulo Virno, A Grammar of the Multitude: For an Analysis of Contemporary Forms of Life, foreword by Sylvère Lotringer, trans. Isabella Bertoletti, James Cascaito, and Andrea Casson (Los Angeles and New York: Semiotexte, 2004), 24. Jon Mckenzie, Perform or Else: From Discipline to Performance (New York: Routledge, 2001). Mohammad Salemy, “Berlin’s Belated Biennale: A Response to the Responses,” Ocula Report (August 9, 2016), accessed February 18, 2018, https://ocula.com/magazine/reports/berlin-s-belated-biennale-a-response-to-the-respon. Italics are mine. The term started to gain visibility circa 2008 when Marisa Olson, Gene McHugh, Artie Vierkant, and several other writers, many associated with the New York City-based organization Rhizome, began to use it as a new nomenclature to describe contemporaneous artistic developments. See Marisa Olson, “Lost not found: the circulation of images in digital visual culture,” in Words without pictures, ​eds. Charlotte Cotton and Alex Klein (New York: Aperture; London: Thames &​ Hudson, 2010); Marisa Olson. “Postinternet: Art After the Internet,” Foam Magazine, no. 29 (October 29, 2011): 59–63, accessed February 18, 2018, https://www.foam.org/foam-magazine/news/foam-magazine-issue-29-what’s-next; Artie Vierkant, “The Image-Object Post-Internet,” artieverkant.com (2010), accessed February 18, 2018; Gene McHugh, Post-Internet: Notes on the Internet and Art, 12.29.09 – 09.05.10 (Brescia: Link Editions, 2011). The diverse positions and debates that constitute “accelerationism” cannot be fully expanded here; for a useful and inclusive source, see Robin Mackay and Armen Avanessian, eds., #Accelerate: The Accelerationist Reader (Falmouth: Urbanomic Media, LTD, 2014). Documenta Newsletter (March 11, 2016), accessed February 20, 2018. The Fridericianum, inaugurated in 1779, is the oldest public museum in Europe. It was heavily bombed by the Allies during World War II and, provisionally restored, chosen by Arnold Bode to serve as main exhibition site for the first documenta in 1955. See Klaus Siebenhaar, documenta: A Brief History of An Exhibition and Its Contexts (Kassel and Berlin: Siebenhaar Verlag, 2017). Greek Travel Pages (March 30, 2017), accessed on February 20, 2018, https://news.gtp.gr/2017/03/30/aegean-direct-athens-kassel-flights-documenta-14-art-show. South as a State of Mind was founded in Athens in 2012 by Marina Fokidis. The Parliament of Bodies, accessed February 20, 2018, http://www.documenta14.de/en/public-programs. Adam Szymczyk, “Iterability and Otherness – Learning and Working from Athens,” The documenta 14 reader (Munich, London, and New York: Prestel Verlag), 26. Marina Gržinić, “From Biopolitics to Necropolitics and the Institution of Contemporary Art,” Pavilion 14 (Bucharest: Romania, 2010), 15. The German Federal Cultural Foundation has been contributing 2.5 million euros to each edition of the biennial since 2004; sponsors also include foundations, cultural institutions, embassies, galleries, and private individuals, as acknowledged in the catalogue. See The Present in Drag, exh. cat. (Berlin: DISTANZ , 2016), 30–32, 367–373. Ibid., Oleg Fonaryov, “Business is Creativity,” 190–193. Ibid., Anonymous author, “Amalia Ulman,” 344. Suely Rolnik, “Politics of Flexible Subjectivity: The Event-Work of Lygia Clark,” Antinomies of Art and Culture: Modernity, Postmodernity, Contemporaneity, trans. Brian Holmes (Durham, NC: Duke University Press, 2008), 7. David Grodzki, “Germany and the crisis of the periphery,” The European Strategist (March 13, 2012), accessed February 24, 2018. Thomas Meaney and Harris Mylonas, “Greece’s crisis, Germany’s gain,” Los Angeles Times, March 15, 2010; “Eurozone crisis saves Germany tens of billions,” Businessweek, July 22, 2012; “Analysis: What taxpayer bailouts? Euro crisis saves Germany money,” Reuters (May 2, 2013), accessed February 24, 2018. Szymczyk, “Iterability and Otherness,” 21. The stakeholders in the board of documenta gGmbH represent the state of Hessen and the city of Kassel. They are mayor Christian Geselle (Vorsitzender, SPD); minister of state Boris Rhein (deputy chairperson, CDU); minister of state Eva Kühne-Hörmann, CDU; councilman Dr. Rabani Alekuzei, SPD; councilman Marcus Leitschuh, CDU; member of the state parliament Karin Müller, GRÜNE; councilman Axel Selbert, LINKE; councilman Gernot Rönz, GRÜNE; councilman Axel Wintermeyer, CDU; and state secretary Dr. Martin J. Worms, independent. See “Documenta 14 Artists Pen Second Open Letter Defending the Exhibition,” artforum.com (December 1, 2017), accessed February 24, 2018. This budget was reported by Catherine Hickley. See Hickley, “Why a World-Famous Art Exhibition Would Need a Government Bailout,” The New York Times (September 20, 2017), accessed February 24, 2018. “Der documenta-Aufsichtstrat hat getagt und bezieht Stellung,” HNA (November 15–19, 2017), accessed February 24, 2018. Benjamin Sutton, “Debtumenta: Governments Step in to Save Documenta from €7 Million Deficit,” Hyperallergic.com (September 13, 2017), accessed February 24, 2018. “Documenta CEO Annette Kulenkampff Steps Down,” artforum.com (November 27, 2017), accessed February 24, 2018. This essay first appeared in l’Autre journal, no. 1 (May 1990), and was included in the translation of the collection les Pourparleurs (Paris: Editions Minuit, 1990) and republished in the journal October 59 (Winter 1992): 3–7. Jonathan Crary, 24/7: Late Capitalism and the End of Sleep, (New York and London: Verso, 2014), 61–89. Even though Greece has been an official member of the European Union since 2004, the Schengen agreement was temporarily suspended (in a state of exception) during documenta 14; border police verified the passports of all those arriving in Kassel via Aegean Airlines flights, while there was no passport control for those arriving in Athens from Kassel. Achille Mbembe, “Necropolitics,” trans. Libby Meintjes, Public Culture 15, no. 1 (Winter 2003): 11–40.